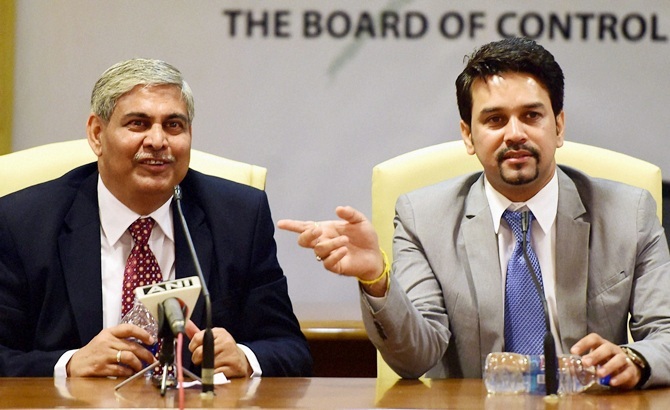 IMAGE: ICC Chairman Shashank Manohar, left, with BCCI president Anurag Thakur in Mumbai. Photograph: PTI . The Board of Control for Cricket in India has expressed its reservations with the International Cricket Council's decision to earmark a budget of $135 million (approx) as the organisational cost for Champions Trophy scheduled in the United Kingdom from June 1-18, next year. The budget is a three-fold increase from the $45 million that was allocated to the BCCI by the ICC for the World T20 held from March 8 to April 3, earlier this year. Whenever ICC conducts any tournament, a certain budget is allocated to the host country. The host country appoints LOC (Local Organising Committee), which is responsible for all the expenditure that may occur while hosting the tournament. What many in BCCI find baffling is the huge cost escalation for a 19-day tournament in UK considering it will host only 15 matches compared to the World T20 in India which was a 27-day event with 58 matches in all (35 men's and 23 women's matches). Also there are reports that the ICC will be building an office in London which will be handed over to the England and Wales Cricket Board (ECB) once the tournament is over. The draft budget for Champions Trophy 2017 was circulated by ICC to its members for review at the ICC Annual Conference held in Edinburgh in May-June. Accordingly, the BCCI has sent a letter to the ICC ‘expressing their reservations about the budget’ and the matter is expected to be discussed on the sidelines of the ICC Chief Executives meeting to be held in Dubai on September 6 and 7. A senior BCCI official, who played a significant role in organisation of the 2011 World Cup and ICC World T20 in 2016, said, "It is strange but when the ICC World T20 was held in India, the BCCI organised a tournament of longer duration at 1/3rd cost. "Even if we take into account that the costs will be more in UK as expenditure will be in GBP (Pounds) but in India, there are more overheads including logistics as you need to take flights from one city to another which is not the case in England." The construction of a new office is also something that is being questioned. "Every member has right to ask as to why all members should pay for office of one member. Looking at the far bigger picture, every penny saved is every penny earned. This money should be used judiciously for development of cricket." As per trends of the various major ICC tournaments that have been held in the past decade, BCCI has found that budget allocation has been significantly less compared to what the countries have got.